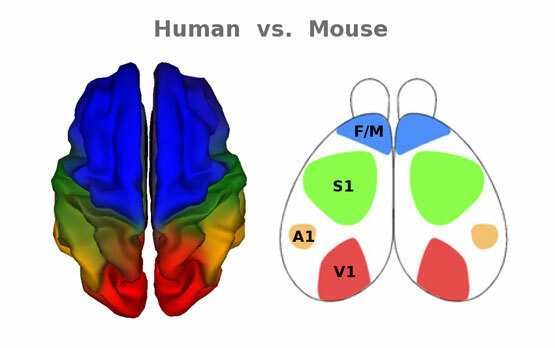 Color-coded representations of human and mouse brains show similarities in cortical functional organization, with some variance according to species-specific needs. F/M indicates the frontal/motor cortex; S1, primary somatosensory cortex; A1, auditory cortex and V1, visual cortex. A new study using magnetic resonance imaging data of 406 adult human twins affirms the long-standing idea that the genetic basis of human cortical regionalization – the organization of the outer brain into specific functional areas – is similar to and consistent with patterns found in other mammals, indicating a common conservation mechanism in evolution. The findings by researchers at the University of California, San Diego School of Medicine and colleagues are published in the November 17 issue of the journal Neuron. Past animal studies, primarily in rodents, have shown that development of distinct areas of the cortex – the outer layer of the brain – is influenced by genes exhibiting highly regionalized expression patterns. The new study is among the first to confirm these findings using data from human subjects. As in other mammals, the researchers found that that genetic influences in human brain development progress along a graduating scale anterior-to-posterior (front-to-back) in a bilateral, symmetric pattern. There were, of course, differences based upon the particular needs and functions of each species. The researchers selected targets called “seed points” in the brain to look for patterns to how each point was related to all other points. They double-checked the validity of these seed points by also examining “marching seeds” – lines of seed points from one brain region to another. “If the results are meaningful, the patterns should remain similar within a region and then change when the seed point enters a new region,” said Kremen. They also used a hypothesis-free approach, a statistical method that doesn’t involve any seed points and so eliminates the possibility of biased assumptions about particular seed points. Anders M. Dale, PhD, professor of radiology and neurosciences at UC San Diego and a co-author of the study, said the study’s findings have both basic and clinical implications. Co-authors of the study are first author Chi-Hua Chen, Matthew S. Panizzon, Wes Thompson, Carol E. Franz and Samar Hamza, UCSD Department of Psychiatry; Lisa T. Eyler and Amy J. Jak, UCSD Department of Psychiatry and VA San Diego Healthcare System; Terry L. Jernigan, UCSD departments of Psychiatry and Cognitive Science; Christine Fennema-Notestine, UCSD departments of Psychiatry and Radiology; Michael C. Neale, Departments of Psychiatry and Human and Molecular Genetics, Virginia Commonwealth University; Michael J. Lyons and Michael D. Grant, Department of Psychology, Boston University; Bruce Fischl, Department of Radiology, Harvard Medical School and Massachusetts General Hospital; Larry J. Seidman, Department of Psychiatry, Harvard Medical School; Ming T. Tsuang, UCSD Department of Psychiatry, Center for Behavioral Genomics and VA San Diego Healthcare System. Funding for the research came, in part, from the National Institute on Aging, the National Institute of Drug Abuse, the National Institute of Neurological Disorders and Stroke, the National Center for Research Resources, the National Institute for Biomedical Imaging and Bioengineering, the National Center for Alternative Medicine, the Ellison Medical Foundation and the U.S. Department of Veterans Affairs.